Recommendations: Treat young voters and children as VIPs; focus on policies affecting kids and young adults; resist the urge to “dumb down” messages aimed at youth. Sheltered: Millennials were highly protected in childhood by a fortress of youth safety initiatives, which they took as evidence that they were truly valuable. This protection has translated into risk aversion in their young adult lives: Millennials are avoiding the stock market and real estate, turning away from entrepreneurship, and are trying to plan for the long term. Recommendations: Showcase positive roles for government and community; promote a culture of public service; adopt language of cooperation—sharing, teams, friends, helping, groups, connection, consensus, etc. 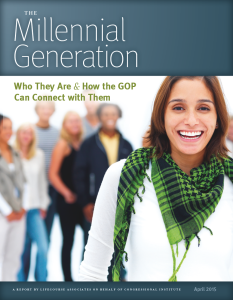 Recommendations: Co-market to all generations using an expanded definition of “family”; help Millennials climb the meritocracy ladder so they can achieve the American Dream; recognize that Millennial views on many social issues can be leveraged to your advantage. Recommendations: Be a good listener and treat all points of view with respect; go out of your way to find common ground with members of the other party; showcase bipartisan accomplishments achieved through compromise. Recommendations: Keep messaging upbeat; address long-term policy issues—like infrastructure, education, fiscal stewardship, and public debt; always emphasize a positive and constructive vision when discussing issues and policy initiatives. Recommendations: Explain foreign policy initiatives in terms of interests and results rather than principles and motives; leverage Millennial support for a strong military and for strong relationships with national allies and peacekeeping organizations; avoid single-issue crisis mode—and articulatea comprehensive game plan for bringing order to a chaotic world.